We are off to Mount Ararat, Turkey’s highest mountain standing at 16,854ft/5,137m. This remote dormant volcanic cone in Eastern Turkey is the legendary resting place of Noah’s Ark according to the Old Testament of the Bible. 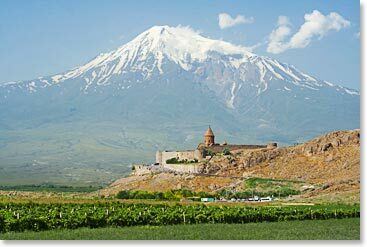 The area is rich in history and plays a significant role in Armenian culture. Mt. Ararat is one of the largest single-mass mountains in the world as it rises dramatically from the plains far below at 2,000ft. The top 3,000ft of Mt Ararat is covered by an ice-cap up to 350ft deep. Follow along on this private expedition as we send dispatches from a mountain of myth, intrigue and beauty! July 23, 2012 – Our Inaugural Dispatch from Turkey!